The Next Generation Air Transportation System's (NextGen) goal is the transformation of the U.S. national airspace system through programs and initiatives that could make it possible to shorten routes, navigate better around weather, save time and fuel, reduce delays, and improve capabilities for monitoring and managing of aircraft. 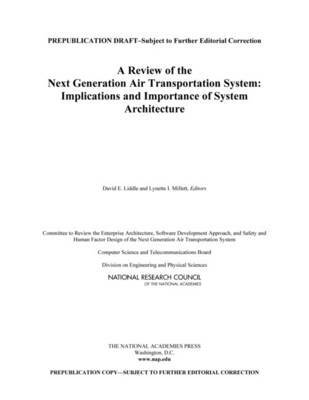 A Review of the Next Generation Air Transportation provides an overview of NextGen and examines the technical activities, including human-system design and testing, organizational design, and other safety and human factor aspects of the system, that will be necessary to successfully transition current and planned modernization programs to the future system. This report assesses technical, cost, and schedule risk for the software development that will be necessary to achieve the expected benefits from a highly automated air traffic management system and the implications for ongoing modernization projects. The recommendations of this report will help the Federal Aviation Administration anticipate and respond to the challenges of implementing NextGen.